What if religions are neither all true nor all nonsense? 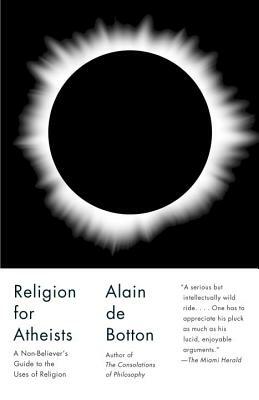 Alain de Botton’s bold and provocative book argues that we can benefit from the wisdom and power of religion—without having to believe in any of it. He suggests that rather than mocking religion, agnostics and atheists should instead steal from it—because the world’s religions are packed with good ideas on how we might live and arrange our societies. De Botton looks to religion for insights into how to build a sense of community, make relationships last, overcome feelings of envy and inadequacy, inspire travel, get more out of art, and reconnect with the natural world. For too long non-believers have faced a stark choice between swallowing lots of peculiar doctrines or doing away with a range of consoling and beautiful rituals and ideas. Religion for Atheists offers a far more interesting and truly helpful alternative. Alain de Botton is the author of essays on themes ranging from love and travel to architecture and philosophy. His best-selling books include How Proust Can Change Your Life, The Art of Travel and The Architecture of Happiness. He lives in London, where he is the founder and chairman of The School of Life (www.theschooloflife.com) and the creative director of Living Architecture (www.living-architecture.co.uk).